The 2019 Toyota Camry Hybrid LE delivers Prius-like fuel economy with blend-in styling. The 2019 Toyota Camry discards its plain vanilla personality in favor of vanilla bean. The 2019 Toyota Camry wants you to think that its wallflower past is well behind it. We’re mostly convinced. Its duds are fresh and edgy, its performance surprising in certain trims, and its tech game is mostly on point. 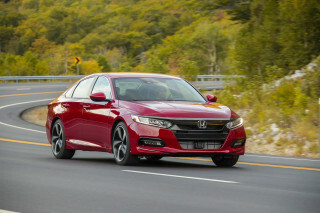 The 2019 Camry mostly carries over after an extensive redesign last year, with one notable reason to buy the latest and greatest: standard Apple CarPlay compatibility, a feature the latest Camry curiously launched without in 2018. Android fans will have to keep waiting, however. Camry shoppers will find a bevy of trims to select from—L, LE, SE, XSE, and XLE. A 2.5-liter inline-4 is standard fare, while a 3.5-liter V-6 is optional on some trims. With EPA ratings as high as the low-50s, the Camry Hybrid may be the best pick of the lineup. The Camry steers with more verve than many shoppers might expect, but its ride remains as cosseting and Lexus-lite as ever. The SE and XSE feature retuned suspensions that are stiffer, if not necessarily more entertaining. Regardless of what’s underhood, the latest Camry casts a daring shadow. It’s far more interesting, if perhaps not as cohesive, as its predecessors. 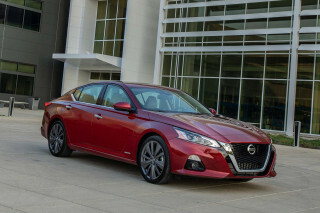 SE and XSE trims are livelier yet with generous blacked-out trim and big wheels for a sporty effect. Inside, the Camry is functional, comfortable, and stylish. It’s not as upmarket as the Honda Accord, but even base trims are well-outfitted and this year’s Apple CarPlay addition is welcome. The best seats in the 2019 Camry are in front. Cloth upholstery comes on base models, but leather can be selected on most of the more expensive trims. The rear seat space could use a bit more headroom; the sloping roofline affects tall passengers in back. The Camry has performed well in crash tests. Every trim comes standard with a bevy of active safety tech, including automatic emergency braking, adaptive cruise control, and active lane control. Starting in the mid-$20,000s, the Camry’s lengthy list of trim levels and option packages means there’s one for just about any buyer—any buyer not lured by a crossover SUV, that is. The 2019 Toyota Camry is, dare we say it, stylish. All models have flair, although that’s discounted somewhat in the base Camry L with its chintzy steel wheels covered by plastic hubcaps. For about $500 more, the Camry LE uses larger alloy wheels that fit its styling personality better. Up front, the Camry has a wide, gaping lower grille in L, LE, and XLE trims. The sport-styled SE and XSE trims swap in a different front bumper that looks almost muscular. The Camry is more conservative in profile, though its roofline slopes toward a truncated tail with wide, complex taillights. A spoiler and a faux diffuser below the bumper add some style to SE and XSE trims. Aside from its badging, the Camry Hybrid doesn’t look any different. Inside, all Camrys have a dramatically styled dashboard that puts the standard 7.0-inch touchscreen for infotainment up high. XSE and XLE trims swap in an crisper 8.0-inch display. The dashboard seems to divide the front seats with its sharp matte silver lines, perhaps almost too much so for some passengers. The 2019 Toyota Camry has a comfortable ride, but it’s not as fun as its styling suggests. The 2019 Toyota Camry comes in two basic flavors, regardless of what’s underhood: comfortable and semi-sporty. We prefer the former, which we think better suits this sedan’s intended mission of reaching a broad swath of buyers. Look for L, LE, or XLE badging on the back of a Camry and you’ll find a soft ride and light, but accurate steering. These versions of the Camry lean into corners and don’t encourage enthusiastic driving, but they’re sufficiently polished and confident. SE and XSE trims swap in a retuned suspension and steering heft that’s firmer, but not necessarily more communicative. A 2.5-liter inline-4 rated at a smidge above 200 horsepower comes standard on all trims and it delivers power to the front wheels via an 8-speed automatic transmission. The base engine provides good power in most situations, but can feel a little gruff at lower speeds. The Camry’s optional 3.5-liter V-6, available on XSE and XLE trims only, delivers an impressive 301 hp, which makes for thrilling acceleration. The V-6 can overpower the front wheels on damp roads, but the Camry’s traction control system is quick to intervene. We’d like to see all-wheel drive with the Camry’s V-6. The Camry Hybrid starts with a 176-hp 2.5-liter inline-4 that pairs to a two-motor hybrid system with a combined output of 208 hp. An electronic continuously variable transmission (CVT) shuttles power forward. In our testing, we’ve found that the hybrid powertrain delivers performance generally equivalent to the base engine. Highway passing can require some planning ahead, but the engine and CVT behave well around town and can operate in fully electric motor at urban and suburban speeds. The gas engine switches over with little discernible difference, a commendable feat. Oddly, only the base Camry Hybrid LE uses a lithium-ion battery pack. The Camry Hybrid XSE and XLE trims use a heavy, lower-tech nickel-metal-hydride battery that dents its fuel economy considerably. The 2019 Toyota Camry is quiet and refined, but rear-seat access is compromised by its daring design. Camry L and LE trims come standard with firm, supportive seats up front wrapped in grippy cloth upholstery. Synthetic leather with a different pattern covers the SE’s seats, while XLE and XSE are upholstered in real leather hides. The base Camry L has a 8-way manually adjustable driver’s seat, but all other trims have power adjustment. A power passenger’s seat is standard on Camrys with leather. Accessing the Camry’s rear seat requires taller passengers to duck their heads due to the low roofline. Once back there, passengers will find good leg room and a well-contoured seat. Heated rear seats aren’t available and only higher trim levels have rear-seat air vents for the climate control system. No Camry has an especially large trunk. The base Camry L has just 14.1 cubic feet, while other trims including the hybrid have 15.1 cubes. Interior small item storage is good, but not exceptional. A wireless cellphone charging pad is optional on most trims, too. Top safety scores and a wide range of crash-avoidance tech make the 2019 Toyota Camry an exceptionally safe choice. Every Camry includes adaptive cruise control, automatic emergency braking with pedestrian detection, and active lane control. Blind-spot monitors are optional on some trim levels. The available Driver Assistance package on higher Camry trims includes a surround-view camera system and rear cross-traffic alerts. An exceptionally broad lineup makes it easy to find the right 2019 Toyota Camry. The 2019 Camry L costs about $24,800 and includes a 7.0-inch touchscreen for infotainment with Apple CarPlay compatibility (but no Android Auto), active safety tech, adaptive cruise control, power features, LED headlights, and Bluetooth. The Camry LE’s power driver’s seat, 17-inch alloy wheels, overhead console, alarm system, and split-folding rear seat seem like worthwhile upgrades for about $500 more. Keyless ignition, a garage door opener, blind-spot monitors, and rear cross-traffic alerts are bundled together in a $1,200 option package. From there, the Camry lineup goes in two directions: SE and XSE have a firmer suspension and different steering tuning, while the XLE retains the softer setup of the L and LE. 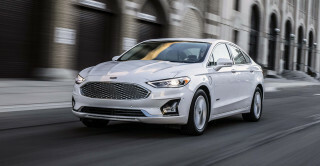 The SE mostly builds on the LE but adds synthetic leather upholstery, a leather-wrapped steering wheel, and a 4.2-inch TFT display in the instrument cluster. XLE and XSE largely mirror one another in terms of features: leather seats that are heated and power-adjustable up front, an 8.0-inch touchscreen for infotainment, keyless ignition, head-up display, and dual-zone automatic climate control. The V-6 engine is optional only on the XLE and XSE trims. Our choice here is either a modestly optioned LE for about $26,500 or a well-equipped, $35,000 XLE with the V-6 that does a convincing luxury sedan impression. Toyota’s strategy with the Camry Hybrid is similar to the standard models but is limited to LE, SE, and XLE trims. The Hybrid LE is equipped like the regular LE model, except with smaller 16-inch wheels with low rolling resistance tires. A $2,700 package adds blind-spot monitors, rear cross-traffic alerts, a power moonroof, an 8.0-inch touchscreen for infotainment, and a wireless charging pad. Camry Hybrid SE and XLE use a different battery that’s heavier and doesn’t provide the same stellar fuel economy as the Hybrid LE. Because of that, we’d stick with the Hybrid LE. For around $28,000, it’s a compelling commuter car. The 2019 Camry’s two available touchscreens for infotainment are bright and respond quickly to inputs, although they aren’t perfect. We applaud the arrival of Apple CarPlay compatibility this year. Android Auto is likely to come in the future, but Toyota hasn’t announced timing yet. The screens can wash out with polarized sunglasses and they are more reflective than some rivals’ displays. Additionally, Toyota dropped the useful Pandora app from its infotainment. Built-in navigation is newly available on XSE and XLE trim levels, however. The 2019 Toyota Camry is thrifty in any guise but especially impressive as a hybrid. The 2019 Toyota Camry has a lengthy fuel economy story to tell. Spoiler alert: it’s economical in every configuration, but more so in certain combinations. Those Camrys are rated by the EPA at 28 mpg city, 39 highway, 32 combined. The base Camry L rides on smaller tires designed for efficiency, not grip. They rate 29/41/34 mpg. 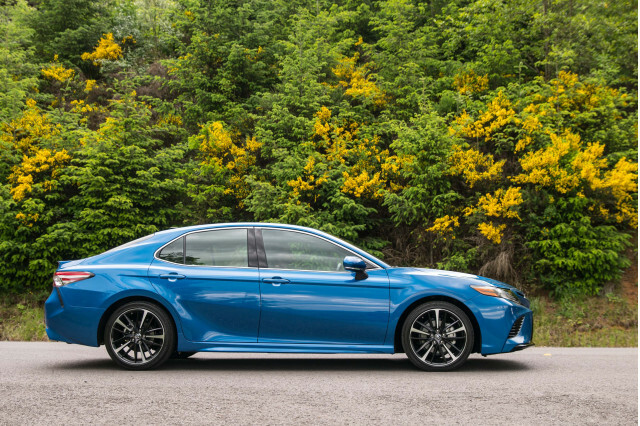 Opt for the V-6 engine and the Camry’s consumption goes up: 22/33/26 mpg for the XLE and 22/32/26 for the XSE with its slightly sportier wheel and tire setup. That’s not the end of the Camry’s fuel economy story, however. The Camry Hybrid LE uses a lithium-ion battery and low rolling resistance tires for an impressive 51/53/52 mpg. If we were to rate the Camry LE Hybrid alone, it would score 8 out of 10 on our scale. Other Camry Hybrids swap in a heavier nickel metal-hydride battery and grippier rubber for 44/47/46 mpg.